Photo Diary: Kayaking in Voss! Voss is the adrenaline capital of Western Norway (aka Fjord Norway). With everything from hiking, mountain biking, sky diving, and alpine skiing, there's plenty to do during both summer AND winter. The city is also neighbor to the town of Gudvangen and the beautiful Nærøyfjord - another one of Norway's many UNESCO World Heritage sites. If you've see the popular movie Frozen then you already have an idea of how beautiful Nærøyfjord is, as it was the inspiration for the city of Arendelle! 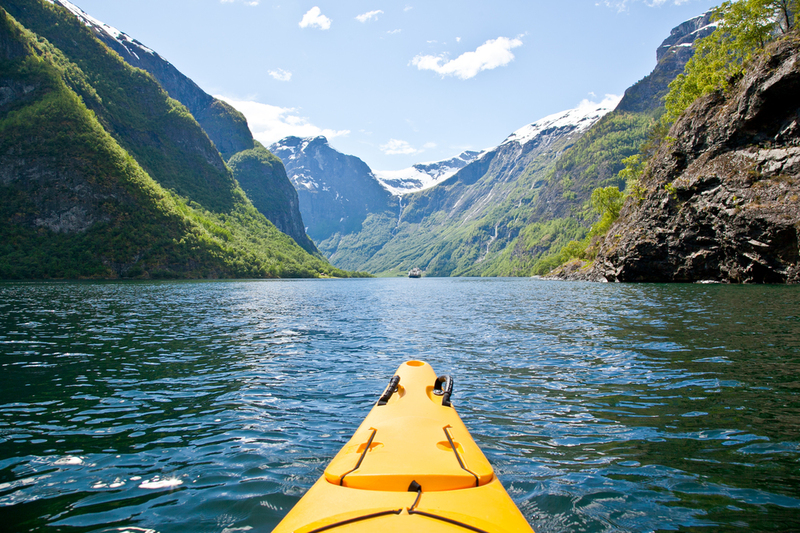 One of the best ways to see and explore the fjord is by kayak - where you can wander the waters at your own pace, pull up along the banks to explore hidden spots, and float down the fjord while you marvel at the mountainous beauty around you. You'll feel like you're in the heart of Norway or like you've been transported to Jurassic Park (minus the dinosaurs, of course)! Photo Diary: Exploring Bergen, Norway!